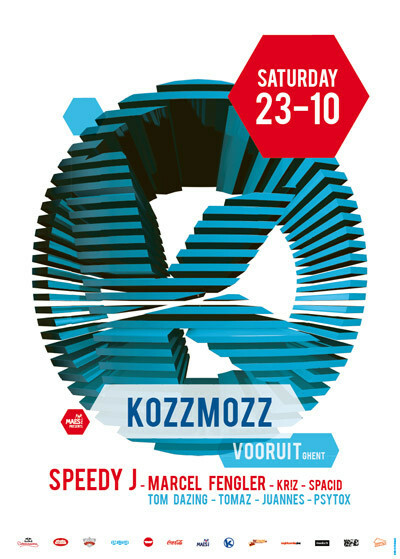 Kozzmozz stands for the most qualitative and upfront techno music around. For this fall edition we have two great international head-liners who are out to push the boundaries of the genre, as such they help in keeping techno fresh and alive in undiscovered ways. Even though Speedy J has been at the forefront of the techno scene since the early ‘90’s, delivering timeless classics such as Pullover on Plus 8 and Krekc on Novamute and his work under Public Energy, he has never lost his touch with the underground. He even embraced the new technologies in such a way that they helped blur the lines between a live act and digital dj-ing. His collaborations with Chris Liebing as Collabs are a perfect example of this vision as well as his solo performances that are spearheading a way of dj-ing that is picked up by a lot of other forward-thinking electronic artists. His new label Electric Deluxe is home to artists like Chris Liebing, George Issakidis, Tommy Four Seven and Terrence Fixmer on which they can showcase the value of creative synergy using the newest technology. From Berlin’s leading techno club Berghain, we welcome Marcel Fengler who has been giving underground techno parties with Marcel Dettmann since the late nineties. He was a Tresor resident but moved to Berghain in 2004. Production-wise, he believes more in quality than quantity which is why he’s only released one record a year since 2007. All his three records on Ostgut Tone were greatly received and established his name as an innovative producer. They were followed by the recent Thwack EP on Luke Slater’s Mote-Evolver. The international guests will be joined by our usual suspects. Spacid, who celebrates his 20th anniversary behind the decks this year and resident Kr!z who sends out the 16th release on his Token label, the Subtext EP by Phase, on the 4th of October. For this edition, Kr!z will play a special longer set in his own trademark sound to make sure the party builds up to the harder edged techno which is still much appreciated by the Kozzmozz die-hards fans. As Kozzmozz wants to offer various shades of techno, there will also be a second room presenting a selection of the best and most qualitative dj’s Belgium has to offer. Starting with Tom Dazing who can now call himself resident of the famous Afterburner parties in U60311 as well as promoter of the Thriller parties in Decadance. He has lots of tracks out on Belgian and German labels and has just re-installed a new studio so more are on the way. Some tracks of Tom can be found on Coincidence Records from Psytox, a label with 36 releases, both digital and vinyl, to its name amongst which several of Psytox himself. A label on the rise as was proved by their own stage on Tomorrowland this summer. They will be joined by Tomaz, whom everybody knows from the Switch radio show on Studio Brussels and his lengthy dj-career, dj-ing up and down the country and abroad. He’s also no stranger to producing as many will still remember his collaboration with the Filterheadz, delivering the classic Sunshine on Carl Cox’s Intec label. Also present will be Juannes, the former resident of P3P in Brussels with Pierre, who now runs his own Plus/Minus parties. And for those wondering ... yes, this year is our 15th anniversary, but all we can tell you for now is that it’s still under construction as we want to make sure that it will be a unique and unforgettable techno fest. So hang in there: you won’t be disappointed! But let’s focus on this upcoming edition for the time being, as it’s going to be a very solid party again, absolutely not to be missed by serious techno heads.